Over four decades the name of Astrosyn has been known internationally as the first source for high performance electrical rotating components designed to meet the demanding specifications of a diversity of clients ranging from Blue Chip Companies and Own Equipment Manufacturers (OEM’s) to Government Agencies. The Company is an Approved Supplier to the UK Government Ministry of Defence. The Astrosyn brand is recognised for world class expertise in the field of rotating electrical machines and this specialist knowledge is available to assist our clients. Lawtronics is a UK market-leading electronics brand, generally associated with battery management products. Since 2000, Lawtronics has been part of the Astrosyn group and the Lawtronics products are manufactured and distributed by Astrosyn International Technology Ltd. Across both brands we offer a full range of OEM products to market sectors as diverse as industrial, instrumentation, healthcare, security, defence, and environmental. As a partner to OEMs and Government Agencies, our responsive R & D facility supplies fully tested, cost-efficient products that meet the tough demands of today’s tightly scheduled production cycles. Our commitment to the most stringent quality standards is formally endorsed by accreditation to BS EN ISO 9001:2015. Our ability to undertake skilled modifications of standard components circumvents the time and cost penalties of conventional design routes yet permits enhancements to be undertaken without invalidating warranties. Among Astrosyn’s many services is the development and manufacture of electromechanical sub-assemblies, fully tested and supplied in call-off batches to meet a client’s tightly scheduled production sequence. By engineering this service as precisely as the product, Astrosyn’s motors and drives design team possesses the inherent flexibility and ‘know-how’ to deliver customised solutions. The same custom service is available for our Lawtronics electronics products, which we are happy to configure to meet specific OEM requirements. either from standard products or through custom assemblies tailored to specific requirements. Astrosyn offers a comprehensive repair service for AC & DC motors of our own manufacture and also for those originally supplied by other specialist companies. The wide scope of this service encompasses stripdown & survey, basic refurbishment, major repairs, and even design modifications to eliminate problems inherent in the original manufacture, e.g. overheating. • Initial inspections (visual, mechanical and electrical). • External cleaning – if grit blasting is necessary, shields are manufactured and fitted to protect critical tolerances, e.g., shaft area. • Inspection of parts and subassemblies. • Measurement of shaft and housing fits. • Reclamation of bearing fits (shaft and flanges). • Airborne noise measurements to NES847. • Structure borne noise measurements to NES813. • Touch up paint system; motor finishing. 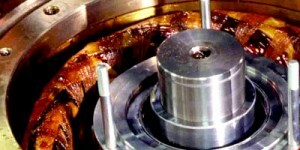 • Flange machining and shaft repair. • Removal of old windings, rewind and varnishing. • Fitting new thermistors to NES requirements. • Skimming of rotors and stators to optimise the air-gap. • Manufacture and fitment of terminal boxes.